Now in its fourth season, the series has grown to include weekly concerts on Tuesday nights over the summer months. 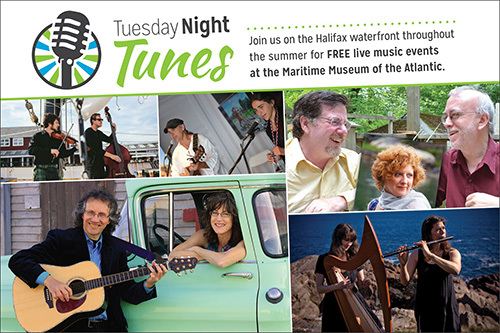 These free performances include a range for all musical tastes – from Acadian and Celtic to sea shanties, African drumming, classical, roots and jazz. With support from Waterfront Development and the Canadian Maritime Heritage Foundation, this popular series is performed in the museums’ intimate outdoor courtyard. The museum’s beautiful Small Craft Gallery will set the stage when inclement weather brings the concerts indoors. The full concert listings are available online but here’s the preview (please call 902-424-7491 to confirm if performer schedule may change).